Located at the Evergreen Brick Works in Toronto's lush Don Valley, Cafe Belong offers quick-serve grab & go, table service dining, weekend brunch, private events and catering. Chef Owner Brad Long and Executive Sous Chef Laird MacArthur create locally sourced dishes alongside an all-Canadian wine list. Chad Roberts Design is specified as the websites creator. two profiles were found for Cafebelong.ca in social networks. Among other social networks the website is represented in Facebook and Twitter. The web server with the IP-address 70.32.68.103 used by Cafebelong.ca is owned by Media Temple and is located in Culver City, USA. 17 other websites are located on this web server. Most of them are provided in the english language. Only a few websites on this web server are x-rated. 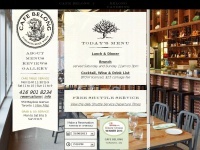 The websites of Cafebelong.ca are hosted by a Apache server and were developed in the programming language PHP. The content management system WordPress is used. The HTML pages were created with the latest standard HTML 5. The visitor analysis software Google Analytics is used to analyze the visitors of the websites. The website does not specify details about the inclusion of its content in search engines. For this reason the content will be included by search engines.